Paradise Lost : A Poem in Twelve Books. London: Printed by Miles Flesher for Jacob Tonson at the Judge's-Head in Chancery-Lane near Fleet-Street, 1688. 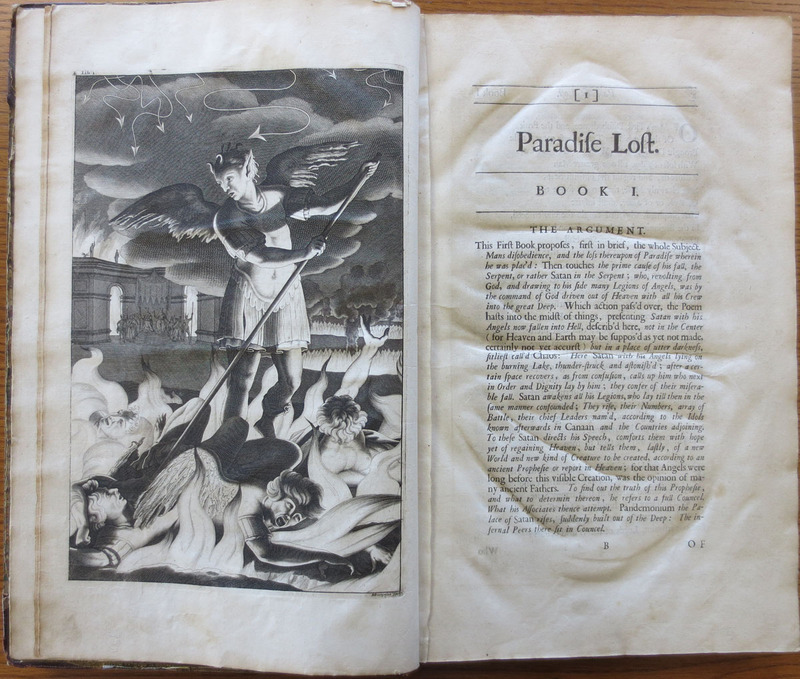 This book is the fourth published edition of Paradise Lost, the first edition published by Jacob Tonson and the earliest held in the Golda Meir Library. Jacob Tonson held a very high regard for Milton's poetry and sought to publish Paradise Lost in a manner worthy of the high quality of the text. To accomplish this, Tonson produced the first illustrated edition and the first in folio. Unfortunately, only the frontispiece and one of the twelve illustrations survives in this copy. The text of this edition comes from the 1678 edition and perpetuates as well as introduces many errors. Many scholars describe this edition as a manifest contradiction -- with the utmost care taken in the physical presentation of the book, and little or no care taken to the textual accuracy. This edition was also the first to be sold by subscription, with Tonson doing much of the solicitation himself. He published this edition jointly with Richard Bently for financial reasons. As a result of this arrangement, three separate title pages can be found for this edition. The most prevalent title page lists the names of both men and is assumed to accompany texts available for sale to the general public. Subscription copies carry title pages designating the publisher responsible for soliciting the subscription. As Tonson solicited the majority of the subscriptions, more copies exist with his title page than with Bently's. This copy carries only Tonson's name on the title page and bears the signature of Ann Littleton, most likely related to the subscriber Sir Thomas Littleton. Of the twelve illustrations appearing in this edition, seven are attributed to John Baptist Medina, one to Bernard Lens, and four are anonymous (including the illustration shown). The designs, one for each book, are not based on the text but on Milton's argument for each book.